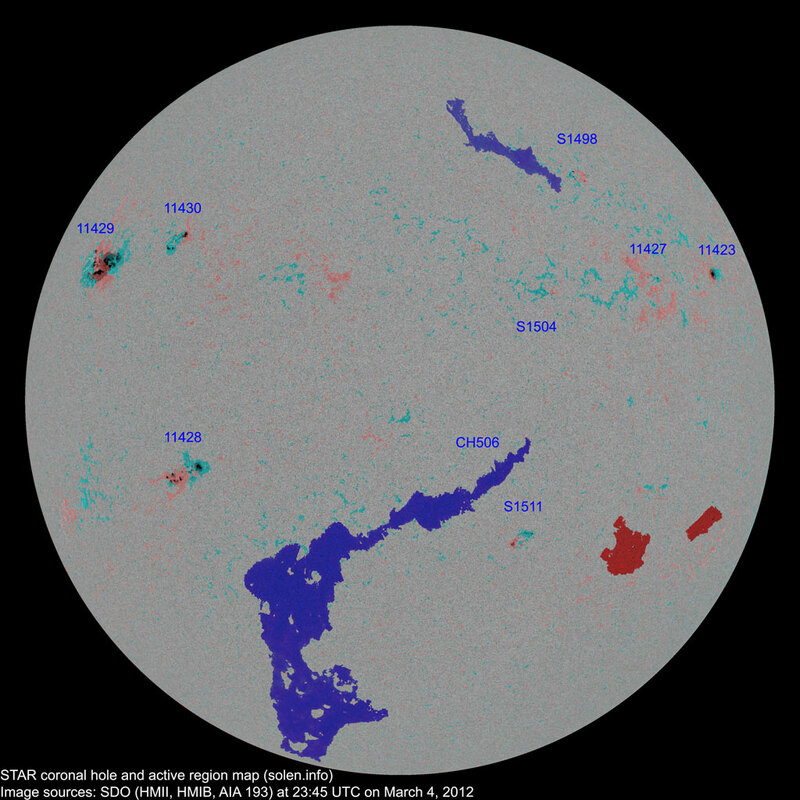 The geomagnetic field was quiet to minor storm on March 4. 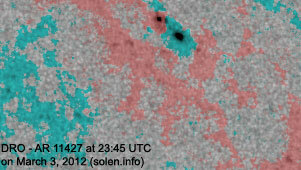 Solar wind speed at SOHO ranged between 342 and 386 km/s. 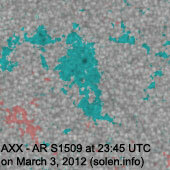 Solar flux measured at 20h UTC on 2.8 GHz was 120.1 (increasing 17.9 over the last solar rotation). 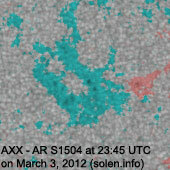 The planetary A index was 14 (STAR Ap - based on the mean of three hour interval ap indices: 13.6). 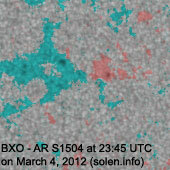 Three hour interval K indices: 53331232 (planetary), 43322232 (Boulder). 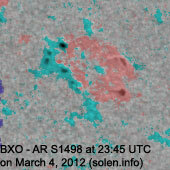 Region 11423 [N16W60] was quiet and stable. 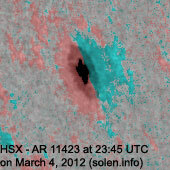 Region 11428 [S17E36] developed further and has at least C class flare potential. 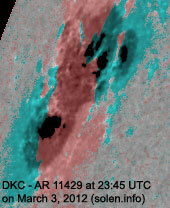 The region has a small magnetic delta structure in a trailing penumbra. 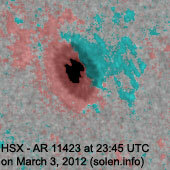 Region 11429 [N17E56] developed and is a compact and complex region capable of producing major (proton) flares. 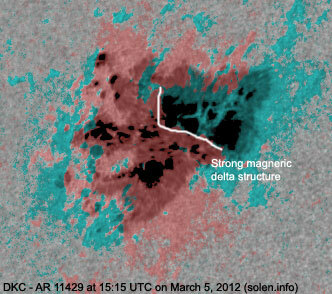 The huge penumbra has an unusually large and strong magnetic delta structure. 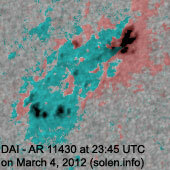 Flares: C1.4 at 01:45, C2.8 at 03:33, C1.3 at 06:51, M2.0/1N long duration event peaking at 10:52 UTC. 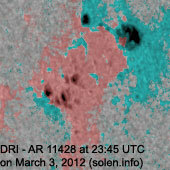 The latter event was associated with a wide CME and a minor increase in proton flux levels. 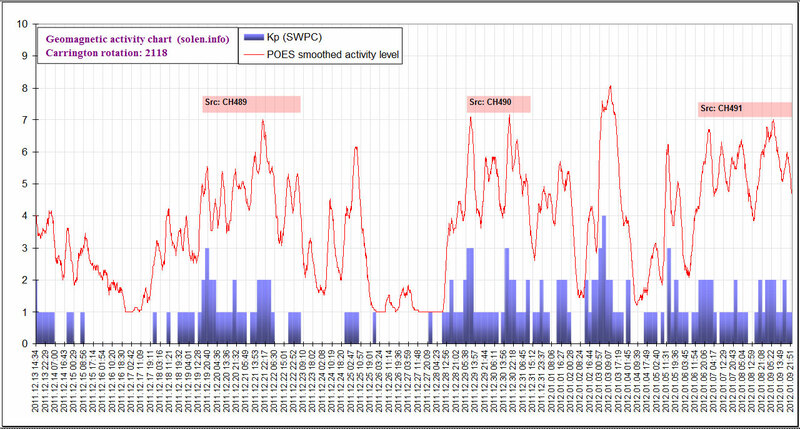 The region produced a major X1.1 long duration event peaking at 04:09 on March 5. 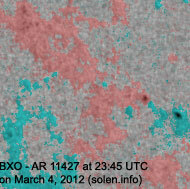 New region 11430 [N19E38] emerged quickly in the northeast quadrant and could produce C flares. 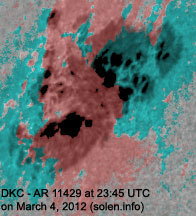 March 2-3: No obviously Earth directed CMEs were observed in LASCO and STEREO imagery. 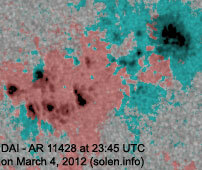 March 4: The long duration M2 event in region 11429 was associated with a full halo CME which could reach Earth on March 6 or early on March 7. 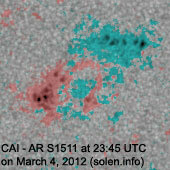 March 5: Another full halo CME was observed after the X1 event early on March 5. 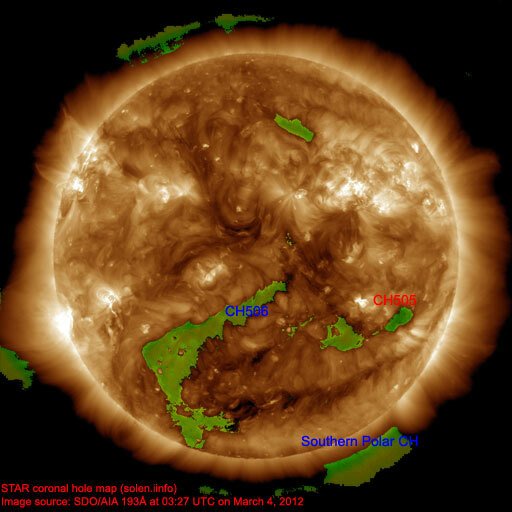 The geomagnetic field is expected to be quiet to unsettled on March 5. Sometime on March 6 or early on March 7 could see the arrival of the CME observed on March 4 and could cause unsettled to minor storm conditions. 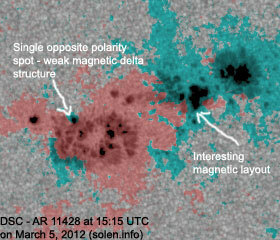 The March 5 CME could arrive late on March 6 or on March 7 and cause unsettled to major storm conditions.